Why the Secretary of Transportation is my favorite Republican. What happened the last time you flew? Did an unforeseen delay stretch into an interminable departure-lounge purgatory, infused with the scent of Burger King, Cinnabun, and cleaning fluid? Maybe you were lucky enough to get on the plane as scheduled, only to be held on the tarmac for an hour or two, or overnight, like those passengers in Rochester, Minnesota, back in August 2009 (after which a passenger reflected, “Now I know what it’s like to be in hell”). Maybe the airline got you into the air, wedged into your cubic yard of space, the seat in front of you reclined to within two inches of your nose, only to have the snack cart—from which you could purchase a bag of potato chips for a mere $7—bang your elbow each time it passed. No room to shift away from the aisle—your fellow passenger staked his ownership of the prime strip of plastic real estate (the precious, precious armrest) within 30 seconds of sitting down. Maybe, when you finally arrived, the airline had lost your baggage. That fee that you paid in order to check your bags? Gone, too. Why doesn’t someone do something about this? Have we all been browbeaten into submission by a nihilistic assumption that airline travel is meant to resemble a medieval form of torture? Good news, fellow sufferers—someone is doing something about this: My favorite Republican, Transportation Secretary Ray LaHood. LaHood has been in the news recently. Following a spate of problems with air traffic controllers, LaHood instituted new rules, increasing the hours they must take off between shifts. The Federal Aviation Administration, which falls under LaHood’s Department of Transportation (DOT), has also suspended or fired several controllers who made errors while working. 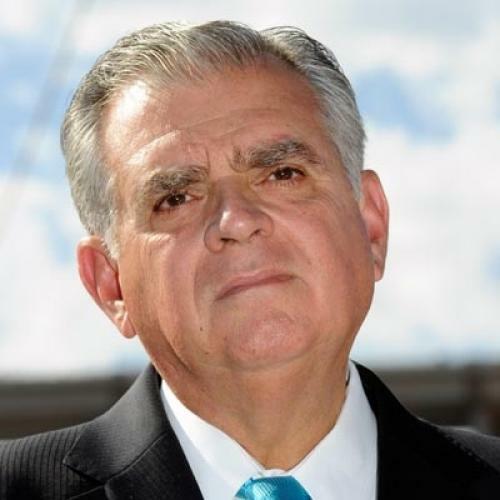 LaHood then appeared on Fox News last Sunday and “The Early Show” on CBS the next morning to suggest that controllers should not nap on the job. But he was quickly chastised: The Boston Globe, the Chicago Tribune, and others whined that you can’t do your job well without sleep. Why all the hubbub surrounding LaHood’s allegedly controversial assertions, such as, “Controllers need to take personal responsibility for the very important safety jobs that they have”? Sure, controllers need sleep—but it should be done at home (or, at least, not at work) and at decent length. After all, a lot of people are counting on controllers (and paying them, as LaHood pointed out) to show up and do their jobs. Indeed, the takeaway here shouldn’t be about napping rights. Rather, everyone who has put up with the increasing annoyances, dangers, and indignities of airline travel should know that, in Ray LaHood, they now have a friend in Washington. This past week, La Hood proved this again when the DOT declared sweeping reforms to expand passenger rights. Starting in August, airlines must, according to a DOT press release, “reimburse passengers for bag fees if their bags are lost, provide consumers involuntarily bumped from flights with greater compensation, expand the current ban on lengthy tarmac delays, and disclose hidden fees.” What does all this mean? Some pretty impressive changes for the millions of people who fly. For example: Currently, if you’re bumped from a flight and delayed for a lengthy period of time (more than two hours for domestic flights, four for international), you’re entitled to compensation equal to double the price of your ticket (up to $800). Under new reforms, you’ll be entitled to up to four times the price of your ticket (up to $1,300). As for tarmac delays, getting stuck on the runway still won’t be fun, but airlines will now be required to send you back into the terminal if you’re stuck in your seat for more than four hours; and, if some snafu keeps you grounded for less than four hours, the airlines will now be required to provide food, water, and working bathrooms. Just as people bristled at LaHood’s statements about air traffic controllers and sleep, these new regulations are bound to have resistors. Airlines will inevitably have their gripes. And, to be sure, the arguments against these reforms are complex. For instance, the practicalities of instituting some of the rules confound. Where and how will the airlines disclose all their expenses, exactly? Will the various permutations of taxes, baggage fees, and further add-ons (meals, wi-fi, etc.) carry over to travel-booking websites? The DOT has promised an additional ruling later in the year to sort out a fee-disclosure protocol. Also, LaHood’s wisdom is not infallible. To return to the debate over sleepy air traffic controllers, there is an argument to be made, perhaps, for allowing them to nap at pre-planned intervals while on the job. Japan and Germany, for example, have quiet rooms and cots for that very purpose. Nonetheless, LaHood is directly and forthrightly responding to what travelers want—and that is something to applaud. A recent Consumer Travel Alliance survey found that 58 percent of respondents said forcing airlines to disclose their fees should be the top priority for the upcoming FAA reauthorization bill in Congress—but LaHood has already taken the first steps toward enforcing such transparency. Moreover, some of his previous reforms have already had dramatic effects. A DOT press release reports that, in August 2009, there were 66 instances of three-hour (or longer) tarmac delays among major airlines; in August 2010, after LaHood’s first round of new regulations for domestic-flight tarmac delays—spurred by that hellish delay in Rochester—had been in place for a number of months, there was only one. To see if I was the only one feeling good about LaHood, I tried to ferret out some discontent among consumer advocates—but I couldn’t find any. “He’s been doing a great job,” Charlie Leocha, director of the Consumer Travel Alliance told me. “We’ve been happy with LaHood across the board,” says Sally Greenberg, executive director of the National Consumers League. Seems I am in good company. So thank you, Secretary LaHood, for your common sense and practical reforms. The next time I’m seething in my airplane seat for some minor annoyance inflated to major proportions, I’ll think of you, take a deep breath, sit back, relax, and enjoy the flight. Chlöe Schama is assistant managing editor of The New Republic.